First and foremost, I have to say that this post is NOT sponsored/paid/promoted, etc. I’m not receiving any kind of compensation. This is simply information I have learned that I would like to share with other families looking to purchase an iPad with the intent to use it as an Augmentative Communication device. Recently, I’ve learned about two different programs with two different mobile carriers that are actually a great options for purchasing an iPad. First, I have Sprint for my mobile phone carrier. I went in to see about an upgrade and learned about Sprint’s “One-Up” program. For cell phones, the “One-Up” program allows you to purchase a new phone for only the tax on the device. You then finance the remaining retail amount with your regular bill. Sprint also offers you a $20 discount on their Unlimited My Way plan for choosing this program. At the end of the year, you can choose to upgrade to a new phone or keep the one you have. – I only had to pay the tax for the $549.99 which is $45.37 (That’s 8.25% sales tax here in Texas). – The $549.99 is then financed over 2 yrs which comes out to about $22 per month. – I then had to change to the Unlimited My Way plan which is $85 per month. However, Sprint gives you a $20 discount when you choose the “One-Up” option, which makes this only $65 per month and gives you unlimited talk, text AND data! Sprint is currently the only provider which offers Unlimited data. – My total bill is now $65 for the phone plan + $22 finance fee = $87/ month which actually came out to less than what I was paying previously! Of special note here is the fact that in 12 months when Apple release the new iPhone I can do this same program with the new iPhone. You DO have to turn in the old phone to get the new one. No more waiting 2 years! Plus, if you do the math, at $22/month for 12 months, I’m actually getting the phone for about $264 which is considerably less than buying it outright. If you choose not to upgrade after a year, you continue the finance payments another 12 months and then you own the phone. So how does this help if I want an iPad?? You can do the “One-Up” program with the iPad! The rep told me that I could add an iPad to my account for $10 a month plus the finance charge, which for a $649 iPad would be about $27/month and I’d only pay tax of $53 that day. So, if you are wanting to get an iPad for your child and you have Sprint, you could go in to a Sprint store (has to be an official Sprint store, this option is not available at third party retailers like Best Buy, Walmart, etc) and ask to add a line to your plan using the “One-Up” plan. Pay the roughly $60 tax and you walk out with a brand new iPad that same day. Monthly, you would be paying roughly $50 for service with the option of using both cellular data and wi-fi. Today, I learned that AT&T has a similar program. AT&T has the “AT&T Next” program which is essentially the same thing, but they do not offer a $20 discount on an unlimited plan. They price roughly the same. Joseph upgraded to a 32 GB iPhone 5s for $37. Talk about a deal! AT&T actually offered a credit for his old phone which is why that is less than what you would figure taxes to be. For the plan, the unlimited talk and text plan was $25 per month and then he had to choose a data plan which came out to $45 per month just for data. When all was said and done his plan plus phone charge came out $95 per month when he was previously paying $150. The rep also confirmed the “AT&T Next” plan was available on the iPad with a $10 a month plan plus the finance charge for the device of your choice. When you think about it, you are basically leasing the phone/iPad with the option to upgrade or own it outright at the end of the term. Either way, it is certainly a worthy option if you are having trouble finding funding for a communication device as many agencies are starting to crack down since many people just want an iPad for the fun stuff and don’t always use it for AAC. After some research, I see that T-Mobile has the JUMP! program and Verizon has the Edge program, which seem to offer similar options, but also offer a 6 month upgrade option. I don’t know the ins and outs of those programs, but definitely check with them to see if this is an option for you. Some cons to this of course include the fact that this is JUST for the device and does NOT cover any accessories or communication programs. Some of the funding options will cover a case and communication program for the iPad, which can deter you from the phone carrier option if you are looking at one of the pricer communication apps. Many apps offer a free trial so you can see if it is a good fit before purchasing. But, really, you should have a qualified Speech Therapist with experience in AAC complete an evaluation to see what device and what app would be most appropriate. Many therapists have all the apps and options to try with your child so you don’t spend $200 to find out your child can’t use the app you bought. And believe it or not, the iPad is not always the best choice. I hope this information is helpful to anyone looking to purchase a device for their child with special needs. Even if you aren’t using AAC, there are a TON of apps that really help to improve cognitive skills, fine motor skills, and promote language development. Check out Bridging Apps for app reviews as they relate specifically to Special Needs. They also have great information on funding sources if you are looking for grants or other programs that will offer a device and communication program. Braxton has really come a long way with using the iPad Mini and we are finally starting to use a free app to test out choice making using a very basic communication app. 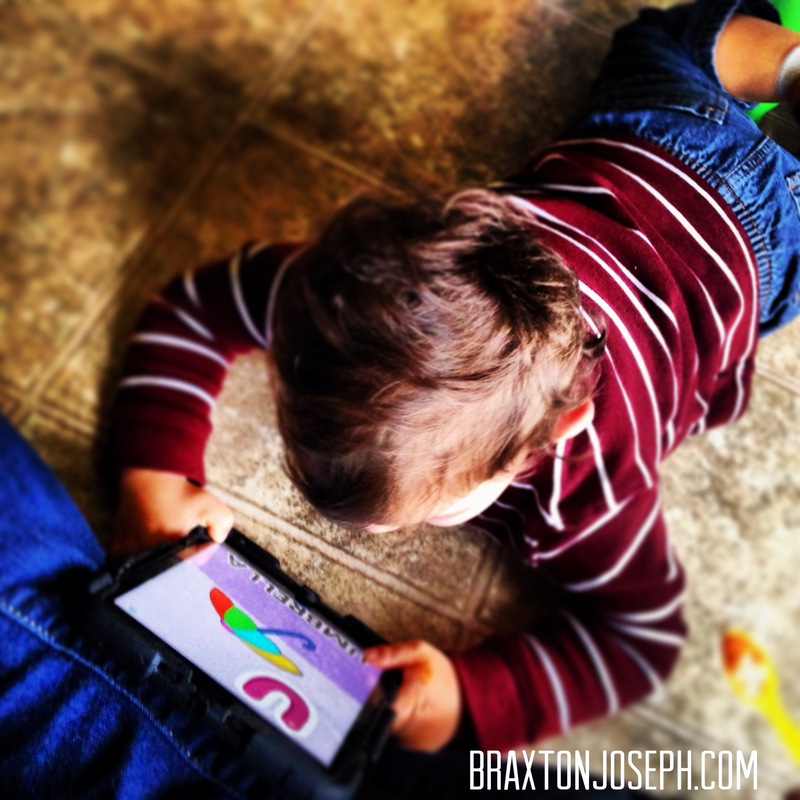 He also enjoys many other apps that teach alphabet, shapes, numbers, music and a variety of other skills. His understanding of Cause and Effect has greatly improved. Initially, he would slam his hand against the iPad over and over. Now, he knows to gently touch and then wait for it to do what it’s supposed to do. With his communication difficulties, it is promising to see him understand how the device works and the potential it has to help him find his voice.